Modern cat house design Kitty Meow from Studio Mango look cute and charming, provide soft and warm beds for cats and add attractive room decor accessories in white, gray, black, red and pink colors to home interiors. Designing attractive houses for cats is a way to show love, making a house pet comfortable and creating modern room decor with attractive, functional and stylish accessories. Kitty Meow cats houses are not made of old suitcases, modern cat houses offer unique design ideas that look like a cat head. Modern pet furniture is getting more interesting and playful. Cat hammocks, cat trees and soft cat beds transform room decor into a comfortable place for cats. Cute colorful cat houses from Studio Mango, www.studiomango.nl/ offer a way to please furry friends and cat owners at the same time. 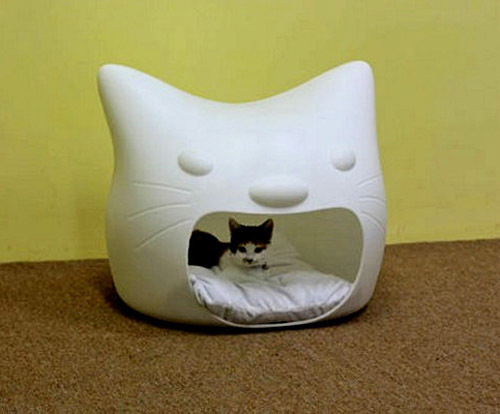 Cats will enjoy comfortable and cozy cat houses, and pet owners will be happy with unusual contemporary design. 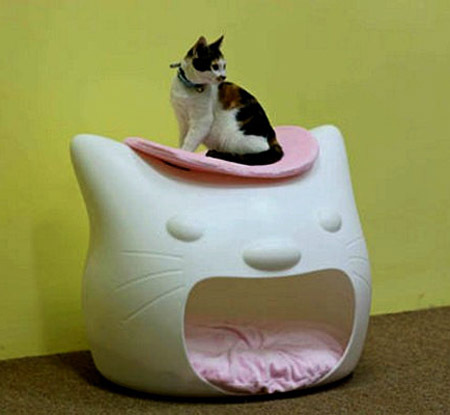 Colorful modern cat houses have two beds, a cat bed inside and a top bed between ears, which allows better observation. Fun cat house design efficiently utilizes available space for creating more fun for cats with lovely accommodations for two cats. Modern cat houses in white, gray, black, red and pink colors, designed by Paul Hendrikx for PetsInn Shanghai, made of contemporary plastic which is easy to clean, demonstrate creative design ideas and make perfect room decor accessories for all cat owners who appreciate humor and unique design for pets.